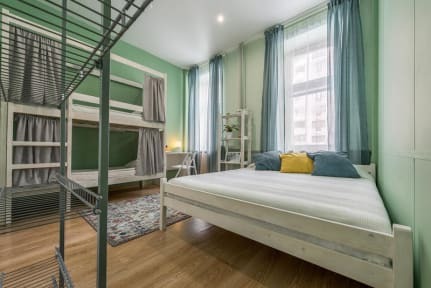 Nice Hostel i Moskva, Rusland: Reservér nu! We know traveling can be exhausting, so we have created a comfortable environment where you will feel right at home. You’ll sleep soundly in soft, clean beds and you’ll have our fully-equipped kitchen to prepare a home cooked meal or to chat with fellow travelers. Our smiling staff is eager to share insider tips on the hottest things to see and do here in beautiful Moscow. Our house was built in 1907-1908. If you will see a ghost, then our responsive administrators will evict him. Nice Hostel is located in Moscow, 1.1 km from Yeliseyevsky Shop and 1.9 km from Bolshoi Theater, 2.9 km from Red Square. Stary Arbat Street is 2.3 km from Nicehostel, and Olympic Stadium is 2.3 km away. Sheremetyevo International Airport is 24.1 km from the property. We provide a selection of rooms (10 in total with 40 beds) including single private double & mixed dormitories with shared bathroom facilities. Our clean spacious dorms consist of 2, 4, 8 and 10 beds. We also have free Wi-Fi for your personal laptop. There is no curfew, so you can come and go 24 hours per day as you please. We keep the hostel very clean and we can provide you with free lockers, free towels, free sheets and blankets, free coffee, tea sugar, salt, oil and more. We love to make parties with you, tell you all the stories of Moscow and show you the best spots in town.